You are a person; you are a son, a daughter, a parent and maybe a sibling, and you have talents and interests. If you are also a person with any type of disability, you are a member of the country’s largest, and most diverse, minority group. People First is a national organization that is run by, and for, people who have a developmental disability. Members of People First are empowered to self-advocate so that they can affect positive change at all levels of society. Please visit the Disability is Natural website for more information on this topic. 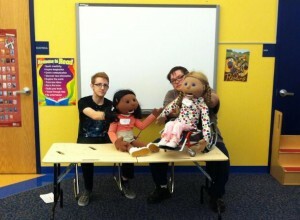 From putting on puppet shows — the life-size puppets have disabilities — at Saint Charles area elementary schools to attending school board meetings and speaking at city council meetings, People First members go out into the community to raise disability awareness. They have participated in campaigns such as “Clean Up Your Language” and “Don’t DIS my ABILITY” to promote inclusion and celebrate the ability and diversity of people with mental, developmental, and physical disabilities. As a person with a disability, you are one of the best people to identify what needs to be changed to improve the lives of all people with disabilities. Working at a chapter, the Missouri State and even national level, People First members identify what laws, facilities and even public signs need to be improved. Then they campaign for legislative and other changes. Currently, People First has worked to increase the Missouri asset limit for Medicaid services, and improve the guardianship bill. Read more about this on the Missouri People First website. The F.A.C.T. People First chapter in Saint Charles County, which has more than 60 members, meets on the third Wednesday of every month at the Developmental Disabilities Resource Board (DDRB). Members learn about their rights, give each other support, and help to raise disability awareness. Anyone interested in working for the rights of people with disabilities is welcome to attend, but voting is restricted to members. Steering committee meetings, hosted by the Missouri State chapter, are held quarterly and each year People First leaders get the chance to meet legislators on Legislative Day. Get the People First Brochure.